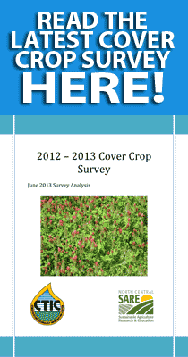 In June 2013 the Nat­ural Resource Con­ser­va­tion Ser­vice (NRCS) released their Cover Crop Ter­mi­na­tion Guide­lines. The guide­lines were met with con­fu­sion with non-​irrigated land as the guide­lines and the Risk Man­age­ment Association’s (RMA) reg­u­la­tion on summer-​fallow did not match up. 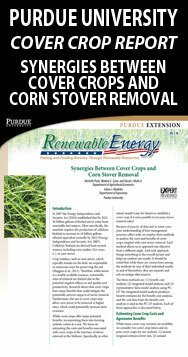 The NRCS and RMA released a change to the orig­i­nal ter­mi­na­tion guide­lines in Decem­ber 2013. The new ter­mi­na­tion guide­lines allow pro­duc­ers in summer-​fallow coun­ties to use cover crops and to receive insur­ance. The adjust­ments made by the RMA and the NRCS Cover Crop Ter­mi­na­tion Guide­lines are jus­ti­fied by the RMA’s con­cern on soil water reten­tion with cover crop use. Pre­vi­ously to be eli­gi­ble for fed­er­ally sub­sided insur­ance, the RMA required pro­duc­ers in coun­ties that received lim­ited pre­cip­i­ta­tion to fol­low the summer-​fallow prac­tice. The summer-​fallow prac­tice required pro­duc­ers to leave their fields bare for one crop year to help replen­ish the soil mois­ture and nutri­ents. If a pro­ducer in a summer-​fallow county did not fol­low the summer-​fallow prac­tice they would not be eli­gi­ble for insurance. How­ever recent stud­ies sug­gest that the sum­mer fal­low prac­tice inten­tions of increas­ing soil mois­ture and nutri­ent avail­abil­ity could be improved with an inten­si­fied crop­ping sys­tem . Under the pre­vi­ous summer-​fallow prac­tice plant­ing a cover crop would have dis­qual­i­fied the ensu­ing cash crop from fed­er­ally sub­si­dized insurance. The revi­sion of the Cover Crop Ter­mi­na­tion Guide­lines between the NRCS and RMA allows pro­duc­ers in summer-​fallow areas to use cover crops and still receive insur­ance under cer­tain guide­lines. The RMA allows cover crops to be grown in the fal­low and receive insur­ance only if the pro­ducer ter­mi­nates the cover crop 90 days prior to plant­ing the insur­able crop. Ter­mi­na­tion guide­lines for pro­duc­ers in con­tin­u­ous crop­ping sys­tem depend on the zone in which the pro­ducer resides; how­ever there are excep­tions to the guide­lines. For exam­ple pro­duc­ers in coun­ties with mul­ti­ple cli­mates or that have improved tech­nol­ogy can alter the ter­mi­na­tion date upon approval of two agri­cul­ture experts. Talk to your insur­ance agent for infor­ma­tion on what qual­i­fies as experts. For more infor­ma­tion on the updated guide­lines use the fol­low­ing link. 1. Blaco-​Canqui, Hum­berto, John D. Hol­mon, Alan J. Schlegel, et al. “Replac­ing Fal­low with Cover Crops in a Semi­arid Soils: Effects on Soil Prop­er­ties.” Soil Sci­ence Soci­ety of Amer­ica. 77.1026−1034 (2013): 2013.